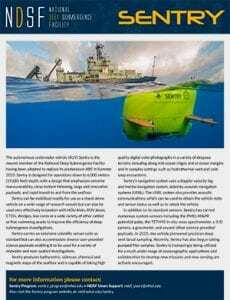 The autonomous underwater vehicle (AUV) Sentry is part of the National Deep Submergence Facility (NDSF). 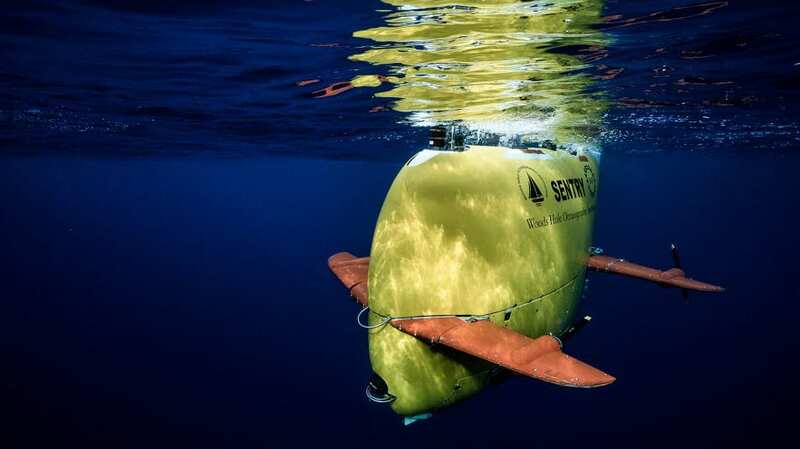 Following in the wake of its predecessor, ABE, Sentry is a fully autonomous underwater vehicle capable of exploring the ocean down to 6,000 meters (19,685 feet) depth. Sentry builds on ABE's success with improved speed, range, and maneuverability. Sentry's hydrodynamic shape also allows faster ascents and descents. Sentry carries a superior science sensor suite and enjoys an increased science payload enabling it to be used for both mid-water and near-seabed oceanographic investigations. Sentry produces bathymetric, sidescan, subbottom, and magnetic maps of the seafloor and is capable of taking digital bottom photographs in a variety of deep-sea terrains such as mid-ocean ridges, deep-sea vents, and cold seeps at ocean margins. Sentry is uniquely able to operate in extreme terrain, including volcano caldera and scarps. Sentry's navigation system uses a doppler velocity log and inertial navigation system, aided by acoustic navigation systems (USBL or LBL). The USBL system also provides acoustic communications, which can be used to obtain the vehicle state and sensor status as well as to retask the vehicle while on the bottom. In addition its standard sensors, Sentry has carried a variety of science-supplied sensors, including the Nakamura redox potential probe, ACFR 3-D imaging system, and the Tethys in-situ mass spectrometer. Like ABE before it, Sentry can be used to locate and quantify hydrothermal fluxes. Sentry is also capable of a much wider range of oceanographic applications due to its superior sensing suite, increased speed and endurance, improved navigation, and acoustic communications. Like ABE, Sentry can be used as a stand alone vehicle or in tandem with Alvin or an ROV to increase the efficiency of deep-submergence investigations.